The polisario is currently taking it on the chin day after day and from all sides, including from its main sponsor, Algeria. The Algerian justice sentenced 26 Sahrawis from the Tindouf camps for illicitly importing vehicles from Europe to Algeria, as the only justification documents they had bore the stamps of the “customs” of the SADR, the pseudo-republic self-proclaimed by the Polisario. Without hesitation, the judges of the court of the city of Mostaganem condemned the 26 Sahrawis to four years in prison and heavy fines. The sentence was felt with much bitterness by the Sahrawis. Obviously, almost no one in the Tindouf camps has any illusions about the far-fetched promises made by the Polisario leaders. Yet, they still believed in the sympathy of the Algerian mentors of the Polisario. As they could not imagine that the Algerian judges would deliver such a harsh sentence on Sahrawis from Tindouf, they indulged in importing cars that they sell to make some money and cope with the harsh living conditions in the camps. However, the Algerian justice was inflexible as the case concerns bringing goods into Algeria fraudulently, without the required authorizations. The justice refused to recognize the legality of the authorizations signed and sealed by the “customs” of the SADR. 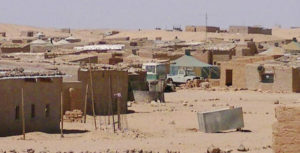 The Polisario propaganda websites have bitterly commented on the case and accused the Algerians of belittling the Sahrawis of Tindouf. The stubborn separatists are seemingly having a rude awakening.